A certain vibrance will be missing on the corner of Telegraph and Durant avenues after street vendor Twigger “Twig” Shellman died in a car accident April 9 at the age of 67. 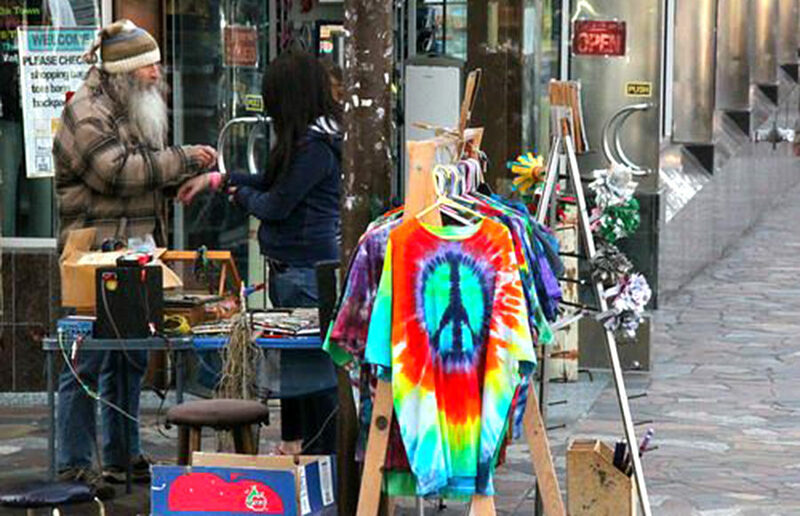 Typical of most vendors on the avenue, Shellman’s stand was always strewn with brilliant tie-dye fabric, which he sold and used to braid people’s hair. Shellman’s personality stood out as bright as the colors on his fabrics, and he is remembered for his kindness throughout the Berkeley community. Fellow vendor Robert, who goes by “Bluei” and did not disclose his last name for safety concerns, described Shellman’s personality as “happy-go-lucky.” Bluei sold jewelry next to Shellman’s stand ever since Shellman came to Berkeley in 1996. The two were very close friends, and as he continues his business on Telegraph Avenue, Bluei says he still feels Shellman’s presence with him. Bluei’s favorite memory of Shellman is when Shellman gave a free hair wrap to a homeless woman. A memorial will be held for Shellman on May 12. In his memory, a small bouquet of roses and a picture have been placed outside Bear Basics, the store outside of which Bluei and Shellman’s stands were located. Now, Bluei’s stand remains alone, as he continues to sell jewelry. Viry Cabral, who works at Bear Basics, recalls how caring Shellman was. “Every day, he could just tell if I was having a rough day, and he would always ask me how I was doing,” Cabral said. Though he was known as a constant presence in Berkeley, Shellman traveled extensively throughout his life. Originally from New York, he explored all around the Bay Area, even living in a truck for a short amount of time. He also went backpacking in India, according to Tabitha Cruz, another friend of Shellman’s.